Byzantine Iconoclasm (Greek: Εἰκονομαχία, Eikonomachía, literally, "image struggle" or "war on icons") refers to two periods in the history of the Byzantine Empire when the use of religious images or icons was opposed by religious and imperial authorities within the Eastern Church and the temporal imperial hierarchy. The "First Iconoclasm", as it is sometimes called, existed between about 726 and 787. The "Second Iconoclasm" was between 814 and 842. According to the traditional view, Byzantine Iconoclasm was started by a ban on religious images by Emperor Leo III and continued under his successors. It was accompanied by widespread destruction of images and persecution of supporters of the veneration of images. The Western church remained firmly in support of the use of images throughout the period, and the whole episode widened the growing divergence between the Eastern and Western traditions in what was still a unified church, as well as facilitating the reduction or removal of Byzantine political control over parts of Italy. Iconoclasm, Greek for "breaker of icons" (Medieval Greek εἰκονοκλάστης, equivalent to Greek εἰκονο- icono- [icon] + κλάστης - [breaker]), is the deliberate destruction within a culture of the culture's own religious icons and other symbols or monuments, usually for religious or political motives. People who engage in or support iconoclasm are called iconoclasts, a term that has come to be applied figuratively to any person who breaks or disdains established dogmata or conventions. Conversely, people who revere or venerate religious images are derisively called "iconolaters" (εἰκονολάτρες). They are normally known as "iconodules" (εἰκονόδουλοι), or "iconophiles" (εἰκονόφιλοι). These terms were, however, not a part of the Byzantine debate over images. They have been brought into common usage by modern historians (from the seventeenth century) and their application to Byzantium increased considerably in the late twentieth century. The Byzantine term for the debate over religious imagery, "iconomachy" means "struggle over images" or "image struggle". Traditional explanations for Byzantine iconoclasm have sometimes focused on the importance of Islamic prohibitions against images influencing Byzantine thought. According to Arnold J. Toynbee, for example, it was the prestige of Islamic military successes in the 7th and 8th centuries that motivated Byzantine Christians to adopt the Islamic position of rejecting and destroying devotional and liturgical images. The role of women and monks in supporting the veneration of images has also been asserted. Social and class-based arguments have been put forward, such as that iconoclasm created political and economic divisions in Byzantine society; that it was generally supported by the Eastern, poorer, non-Greek peoples of the Empire who had to constantly deal with Arab raids. On the other hand, the wealthier Greeks of Constantinople and also the peoples of the Balkan and Italian provinces strongly opposed Iconoclasm. Re-evaluation of the written and material evidence relating to the period of Byzantine Iconoclasm by scholars including John Haldon and Leslie Brubaker has challenged many of the basic assumptions and factual assertions of the traditional account. Christian worship by the sixth century had developed a clear belief in the intercession of saints. This belief was also influenced by a concept of hierarchy of sanctity, with the Trinity at its pinnacle, followed by the Virgin Mary, referred to in Greek as the Theotokos ("birth-giver of God") or Meter Theou ("Mother of God"), the saints, living holy men, women, and spiritual elders, followed by the rest of humanity. Thus, in order to obtain blessings or divine favour, early Christians, like Christians today, would often pray or ask an intermediary, such as the saints or the Theotokos, or living fellow Christians believed to be holy, to intercede on their behalf with Christ. A strong sacramentality and belief in the importance of physical presence also joined the belief in intercession of saints with the use of relics and holy images (or icons) in early Christian practices. The goal of the iconoclasts was to restore the church to the strict opposition to images in worship that they believed characterized at the least some parts of the early church. Theologically, one aspect of the debate, as with most in Christian theology at the time, revolved around the two natures of Jesus. Iconoclasts believed that icons could not represent both the divine and the human natures of the Messiah at the same time, but only separately. Because an icon which depicted Jesus as purely physical would be Nestorianism, and one which showed Him as both human and divine would not be able to do so without confusing the two natures into one mixed nature, which was Monophysitism, all icons were thus heretical. Reference was also made[by whom?] to the prohibitions on the worship of graven images in the Mosaic Law, but the nature of Biblical law in Christianity has always been in dispute. However, no detailed writings setting out iconoclast arguments have survived; we have only brief quotations and references in the writings of the iconodules. Leo is said to have described mere image veneration as "a craft of idolatry." He apparently forbade the veneration of religious images in a 730 edict, which did not apply to other forms of art, including the image of the emperor, or religious symbols such as the cross. "He saw no need to consult the Church, and he appears to have been surprised by the depth of the popular opposition he encountered". Germanos I of Constantinople, the iconophile Patriarch of Constantinople, either resigned or was deposed following the ban. Surviving letters Germanos wrote at the time say little of theology. According to Patricia Karlin-Hayter, what worried Germanos was that the ban of icons would prove that the Church had been in error for a long time and therefore play into the hands of Jews and Muslims. At this stage in the debate there is no clear evidence for an imperial involvement in the debate, except that Germanos says he believes that Leo III supports images, leaving a question as to why Leo III has been presented as the arch-iconoclast of Byzantine history. Almost all of the evidence for the reign of Leo III is derived from textual sources, the majority of which post-date his reign considerably, most notably the Life by Stephen the Younger and the Chronicle of Theophanes the Confessor. These important sources are fiercely iconophile and are hostile to the Emperor Constantine V (741-775). As Constantine's father, Leo also became a target. Leo's actual views on icon veneration remain obscure, but in any case may not have influenced the initial phase of the debate. Leo died in 741, and his son and heir, Constantine V (741–775), was personally committed to an anti-image position. Despite his successes as an emperor, both militarily and culturally, this has caused Constantine to be remembered unfavourably by a body of source material which is preoccupied by his opposition to image veneration. In 754 Constantine summoned the Council of Hieria in which some 330 to 340 bishops participated and which was the first church council to concern itself primarily with religious imagery. Constantine seems to have been closely involved with the council, and it endorsed an iconoclast position, with 338 assembled bishops declaring, "the unlawful art of painting living creatures blasphemed the fundamental doctrine of our salvation--namely, the Incarnation of Christ, and contradicted the six holy synods. . . . If anyone shall endeavour to represent the forms of the Saints in lifeless pictures with material colours which are of no value (for this notion is vain and introduced by the devil), and does not rather represent their virtues as living images in himself, etc. . . . let him be anathema." This Council claimed to be the legitimate "Seventh Ecumenical Council", but its legitimacy is disregarded by both Eastern and Western traditions as no patriarchs or representatives of the five patriarchs were present: Constantinople was vacant while Antioch, Jerusalem and Alexandria were controlled by Muslims, and Rome did not send a representative. The iconoclast Council of Hieria was not the end of the matter, however. In this period complex theological arguments appeared, both for and against the use of icons. 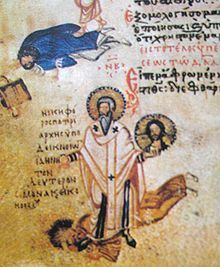 Constantine himself wrote opposing the veneration of images, while John of Damascus, a Syrian monk living outside of Byzantine territory, became a major opponent of iconoclasm through his theological writings. It has been suggested that monasteries became secret bastions of icon-support, but this view is controversial. A possible reason for this interpretation is the desire in some historiography on Byzantine Iconoclasm to see it as a preface to the later Protestant Reformation in western Europe, in which monastic establishments suffered damage and persecution. In opposition to this view, others have suggested that while some monks continued to support image veneration, many others followed church and imperial policy. The surviving sources accuse Constantine V of moving against monasteries, having relics thrown into the sea, and stopping the invocation of saints. Monks were forced to parade in the Hippodrome, each hand-in-hand with a woman, in violation of their vows. In 765 St Stephen the Younger was killed, and was later considered a martyr to the Iconophile cause. A number of large monasteries in Constantinople were secularised, and many monks fled to areas beyond effective imperial control on the fringes of the Empire. Unlike the iconoclast council, the iconophile council included papal representatives, and its decrees were approved by the papacy. The Eastern Orthodox Church considers it to be the last genuine ecumenical council. Icon veneration lasted through the reign of Empress Irene's successor, Nikephoros I (reigned 802–811), and the two brief reigns after his. Michael was succeeded by his son, Theophilus. Theophilus died leaving his wife Theodora regent for his minor heir, Michael III. Like Irene 50 years before her, Theodora presided over the restoration of icon veneration in 843, on the condition that Theophilus not be condemned. Since that time the first Sunday of Great Lent has been celebrated in the Orthodox Church and in Byzantine Rite Catholicism as the feast of the "Triumph of Orthodoxy". "Supported by the Holy Scriptures and the Fathers, we declare unanimously, in the name of the Holy Trinity, that there shall be rejected and removed and cursed one of the Christian Church every likeness which is made out of any material and colour whatever by the evil art of painters.... If anyone ventures to represent the divine image (χαρακτήρ, kharaktír - character) of the Word after the Incarnation with material colours, he is an adversary of God. .... If anyone shall endeavour to represent the forms of the Saints in lifeless pictures with material colours which are of no value (for this notion is vain and introduced by the devil), and does not rather represent their virtues as living images in himself, he is an adversary of God"
For iconoclasts, the only real religious image must be an exact likeness of the prototype -of the same substance- which they considered impossible, seeing wood and paint as empty of spirit and life. Thus for iconoclasts the only true (and permitted) "icon" of Jesus was the Eucharist, the Body and Blood of Christ, according to Orthodox and Catholic doctrine. It was also seen as a departure from ancient church tradition, of which there was a written record opposing religious images. The Spanish Synod of Elvira (c. 305) had declared that "Pictures are not to be placed in churches, so that they do not become objects of worship and adoration", and some decades later Eusebius of Caesaria may have written a letter to Constantia (Emperor Constantine's sister) saying "To depict purely the human form of Christ before its transformation, on the other hand, is to break the commandment of God and to fall into pagan error"; Bishop Epiphanius of Salamis wrote his letter 51 to John, Bishop of Jerusalem (c. 394) in which he recounted how he tore down an image in a church and admonished the other bishop that such images are "opposed . . . to our religion", although the authenticity of this letter has also long been disputed, and remains uncertain. However, as Christianity increasingly spread among gentiles with traditions of religious images, and especially after the conversion of Constantine (c. 312), the legalization of Christianity, and, later that century, the establishment of Christianity as the state religion of the Roman Empire, many new people came into the new large public churches, which began to be decorated with images that certainly drew in part on imperial and pagan imagery: "The representations of Christ as the Almighty Lord on his judgment throne owed something to pictures of Zeus. Portraits of the Mother of God were not wholly independent of a pagan past of venerated mother-goddesses. In the popular mind the saints had come to fill a role that had been played by heroes and deities." John declared that he did not worship matter, "but rather the creator of matter." He also declared, "But I also venerate the matter through which salvation came to me, as if filled with divine energy and grace." He includes in this latter category the ink in which the gospels were written as well as the paint of images, the wood of the Cross, and the body and blood of Jesus. This distinction between worship and veneration is key in the arguments of the iconophiles. Further, in their view idols depicted persons without substance or reality while icons depicted real persons. Essentially the argument was that idols were idols because they represented false gods, not because they were images. Images of Christ, or of other real people who had lived in the past, could not be idols. This was considered comparable to the Old Testament practice of only offering burnt sacrifices to God, and not to any other gods. Iconophiles further argued that decisions such as whether icons ought to be venerated were properly made by the church assembled in council, not imposed on the church by an emperor. Thus the argument also involved the issue of the proper relationship between church and state. Related to this was the observation that it was foolish to deny to God the same honor that was freely given to the human emperor, since portraits of the emperor were common and the iconoclasts did not oppose them. ^ Toynbee, Arnold Joseph. A Study of History: Abridgement of volumes VII-X. p. 259. ^ Brubaker, Leslie; Haldon, John (6 January 2011). "1". Byzantium in the Iconoclast Era, C. 680-850: A History. United Kingdom: Cambridge University Press. p. 32. ISBN 978-0-521-43093-7. Retrieved 10 January 2015. ^ C. Mango and R. Scott, trs., The Chronicle of Theophanes Confessor (Oxford, 1997). ^ C. Mango, ed. and tr., The short history of Nikephoros (Washington, 1990). ^ M.-F. Auzépy, tr., La vie d'Étienne le jeune par Étienne le Diacre (Aldershot, 1997). ^ I. Ševčenko, "Hagiography in the iconoclast period," in A. Bryer and J. Herrin, eds., Iconoclasm (Birmingham, 1977), 113–31. ^ A. Louth, tr., Three treatises on the divine images (Crestwood, 2003). ^ C.P. Roth, tr., On the holy icons (Crestwood, 1981). ^ M.-J. Mondzain, tr., Discours contre les iconoclastes (Paris, 1989), Exodus 20:1-17. ^ The Oxford History of Byzantium: Iconoclasm, Patricia Karlin-Hayter, Oxford University Press, 2002. ^ David Knowles – Dimitri Oblensky, "The Christian Centuries: Volume 2, The Middle Ages", Darton, Longman & Todd, 1969, p. 108-109. ^ "Internet History Sourcebooks Project". ^ Scriptor Incertus 349,1–18, cited by Pratsch, Theodoros, 208. ^ Literatures, Prof. John P. Adams, Modern and Classical Languages and. "CANONS OF THE CHURCH COUNCIL ELVIRA (Granada) ca. 309 A. D."
^ The letter's text is incomplete, and its authenticity and authorship uncertain. David M. Gwynn, From Iconoclasm to Arianism: The Construction of Christian Tradition in the Iconoclast Controversy [Greek, Roman, and Byzantine Studies 47 (2007) 225–251], p. 227-245. ^ Henry Chadwick, The Early Church (The Penguin History of the Church, 1993), 283. Fordham University, Medieval Sourcebook: John of Damascus: In Defense of Icons.